We’d love your help. Let us know what’s wrong with this preview of Compass South by Hope Larson. To ask other readers questions about Compass South, please sign up. This is an adventure story, without the politics or religion of Pullman's series. Or the language. But it reminds me of so many books I read growing up: The Prince and the Pauper, Around the World in Eighty Days, Hardy Boys. Castaway kids. The Swiss Family Robinson. Kids making their way in the world, some of them orphans. Danger, thrills. Lots of swash and adventuring in this beautifully illustrated story of a sister and her twin brother, a lost/absent father, a possible treasure, the girl pretending to be a boy, thieves, pirates, nefarious schemes and plenty of action. A quick and fun read. Manhattan, 1860. Red-headed twins Cleopatra and Alexander find themselves burglaring for an orphan street gang after their father goes out to a job one day and never returns. A run-in with the police and an ad in the paper send them off on an ocean adventure that includes another set of red-headed twins, some pirates, heirlooms that are more than what they appear, and finding out who they are as individuals. It's a fun, fast-paced, sea-adventure graphic novel with diverse characters and a forward Manhattan, 1860. Red-headed twins Cleopatra and Alexander find themselves burglaring for an orphan street gang after their father goes out to a job one day and never returns. A run-in with the police and an ad in the paper send them off on an ocean adventure that includes another set of red-headed twins, some pirates, heirlooms that are more than what they appear, and finding out who they are as individuals. It's a fun, fast-paced, sea-adventure graphic novel with diverse characters and a forward-moving plot. The art is bright, breezy, and endearing. Compass South is one of the best adventure comics I’ve read in years. Hope Larson’s script delivers a propulsive narrative with engaging characters, and Rebecca Mock’s expressive art masterfully flushes the world of 1860 and the folks who live in it. As dialogue goes, many historical comics create an obstacle for readers. Either the author offers up text that is too wrapped up in period syntax to make for an easy read (leading a prospective younger audience struggle), or they eschew that syntax Compass South is one of the best adventure comics I’ve read in years. Hope Larson’s script delivers a propulsive narrative with engaging characters, and Rebecca Mock’s expressive art masterfully flushes the world of 1860 and the folks who live in it. As dialogue goes, many historical comics create an obstacle for readers. Either the author offers up text that is too wrapped up in period syntax to make for an easy read (leading a prospective younger audience struggle), or they eschew that syntax for a more modern style of dialogue and in doing so robs the story of its flavor and verisimilitude. Compass South strikes a deft balance between delivering period authenticity (if there were anachronisms in content or dialogue, none jumped out at me) and accessibility. Though the story pulls no punches with its depictions of life-and-limb danger, it’s entirely appropriate for a younger audience, and I suspect that I’ll either read it with my daughter (six) soon or pass it on for her to read herself. The dialogue makes that possible, but it also doesn’t mar the experience for adult period buffs, either. Like many YA books, this one allows for a sequel, but is a complete story in its own right (installment books that fail to deliver a stand-alone reading experience are a pet peeve, so that aspect is certainly appreciated). I can think of few books whose arrival I anticipate more than the follow-up to this one. Compass South was originally published in 2016, and I hadn't heard about it until the awesome folks over at :01 First Second Books invited me to join the blog tour for the sequel, Knife's Edge. Also, I really hadn't been into graphic novels until very recently, so I guess that's another reason I hadn't heard of it. But now that I'm obsessed with graphic novels, I jumped on the chance to check this out - I mean, Check out this and other reviews on my young adult book blog, Here's to Happy Endings! Compass South was originally published in 2016, and I hadn't heard about it until the awesome folks over at :01 First Second Books invited me to join the blog tour for the sequel, Knife's Edge. Also, I really hadn't been into graphic novels until very recently, so I guess that's another reason I hadn't heard of it. But now that I'm obsessed with graphic novels, I jumped on the chance to check this out - I mean, face it - a middle grade graphic novel adventure that features pirates, twins, and secrets? Yes, please - sign me up! Twins Alex and Cleo are twelve years old, and they are essentially abandoned by a father who leaves on a job and never returns. After waiting for a few weeks, they realize that something horrible must have happened and that he isn't coming back, and they decide to take up an offer in the newspaper about a man looking to find his twin boys, both of whom have red hair. The man is offering a reward, and they figure hey, why not? They don't have anything to lose, and they're down on their luck, so Cleo cuts off her hair and the two decide to board a ship and head to San Francisco. So the twins sell off their old gang boss's identity (they were a part of the Black Hook Gang, completing robberies and the like), and in exchange will receive passage to New Orleans, where they can begin a new life. Since they want to get to San Francisco, they decide that this is good for now - they can complete the journey on their own. Unfortunately, they meet up with another set of twins who have the same idea, and Alex and Cleo get separated from each other - and the other set of twins get separated as well. Alex is kidnapped and thrown on a ship, where he is forced to work, while Cleo becomes a stowaway on another ship, hoping that she will meet Alex at the end of their journeys. All through this, we see glimpses of the Black Hook Gang and how they are after both Alex and Cleo, looking for them and the two items that they hold dear - a pocket watch and a knife, from their mother, before she died. Avoiding these people is difficult, and when they get separated and are forced to do what they can to survive, it becomes a really fun and interesting adventure. This is such a fun story, and it worked out amazingly well as a graphic novel. It was the kind of fun that keeps you at the edge of your seat and allows you to use your own mind to slowly put the pieces of the puzzle together. The twins are great characters and the story goes back and forth between Alex and Cleo. It's easy to follow, and the twists and turns keep it interesting and exciting through the very last page. I loved both Alex and Cleo as characters. Alex is a hardworking, steadfast character who knows what he wants, and Cleo is loyal and, at the same time, independent. She does what needs to be done. I think that the way her character was written will definitely draw in a lot of readers - middle grade readers especially will rejoice when they have the chance to read an enthralling and exciting story about these two. 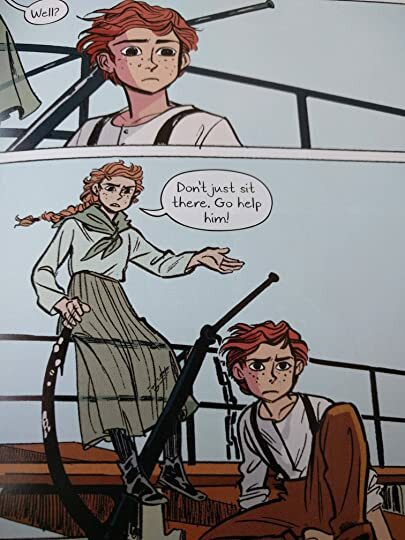 The artwork in Compass South was beautifully done - I really love Rebecca Mock's style and the way that she was able to really make her characters come to life through her art. The images and the story meshed so well together and were both so full of life. This is the very first middle grade graphic novel that I've read, and I can't wait to pick up more! Compass South was such a delight to read - the story was a complete adventure from the very beginning until the last page, and I'm thrilled that the sequel is soon to be published as well, giving us a chance to see what happens in the lives of Alex and Cleo after the end of Compass South. This reminded me a lot of Amulet, I really liked the friendship and the adventure. This review has been hidden because it contains spoilers. To view it, click here. I was pleased to find this as I've heard of Hope Larson before, and it seemed like an interesting concept. The art is sound and the world is well-populated. However, I found the turns of events predictable and irritating. Two sets of twins are both looking to answer an ad, where a wealthy father looks to be reunited with his red-headed twin sons, as impostors. Naturally they run into each other, get mixed up while fleeing, and have to tolerate each other as they journey towards San Francisco and, I was pleased to find this as I've heard of Hope Larson before, and it seemed like an interesting concept. The art is sound and the world is well-populated. However, I found the turns of events predictable and irritating. Two sets of twins are both looking to answer an ad, where a wealthy father looks to be reunited with his red-headed twin sons, as impostors. Naturally they run into each other, get mixed up while fleeing, and have to tolerate each other as they journey towards San Francisco and, hopefully, towards their other sibling. (Common plot thread.) The two sets both end up on separate ships and go through slightly different journeys, but given that they both look almost exactly alike I found it difficult to keep track, despite unique personalities. This wasn't helped by the fact that the main twins, Cleo and Alex, kept handing off their heirlooms to each other or losing them to thieves. There's also the "magical twin connections" in which Alex was literally given visions and answers as if Cleo was right beside him saying it. I'm not a twin myself, but from friends who are, I hear this is an annoying cliche. The one aspect I actually liked was the friendship that developed between Alex and...Edwin? The lads eventually opened up to each other and show a little of their goals and their backstory. It was a pleasing chapter, but the only one of its kind. One of the groups runs into a native girl and has some adventures with her. But the girl is named "Sar"--which means "Monkey." Really? In this volume, I encountered no other racism, refreshingly. The one black man who was refused marriage to the woman he loved was because of his profession, not his skin tone. However, we were hit over the head with restraints on Cleo, one of the twins, at every instance someone found out she was a girl (disguised as a boy). The other characters immediately and consistently alter their behavior towards her when they find out the truth. She didn't push back on this at all. She even developed a crush on one of the other twins who had done nothing but insult her and make her stay behind. He later told her he "thought of her as a sister...as a brother," but just a few pages after that, kissed her anyway. (Uh?) This was also the second young man to show interest in her despite looking at least a few years older--and she is twelve, by the way, so that age difference might be significant. True story: yesterday I was at the bookstore, and I overheard a grandmother asking a clerk to help her find a book for her grandson. She had a short list of titles, but could not find any of them on the shelves. I hear the bookseller say, "Oh, that's because these are with the graphic novels." After a short pause (I wish I could have seen their faces! ), she added, "Graphic novels as in novels with lots of pictures, not GRAPHIC novels! ", and I heard the grandmother let out a big breath and say, " True story: yesterday I was at the bookstore, and I overheard a grandmother asking a clerk to help her find a book for her grandson. She had a short list of titles, but could not find any of them on the shelves. I hear the bookseller say, "Oh, that's because these are with the graphic novels." After a short pause (I wish I could have seen their faces! ), she added, "Graphic novels as in novels with lots of pictures, not GRAPHIC novels! ", and I heard the grandmother let out a big breath and say, "Ohhh.... okay." This is a great book, I loved graphic novels and this is a great choice for everybody to read it. The ending was sad, I love it and I can’t wait for chapter 2 of this you should watch it, it is really good. This book was really cute and loving. I loved how they are separated and how they miss each other. I thought it was adorable how Cleopatra's relationship with her guy. How she got jealous that he kissed someone was so cute and how they kissed each other. I cannot wait to see how the father is. "I bought 'er that shell from Tahiti. She sewed it over her eye patch so she could watch over me, no matter the distance between us." This adventure novel has it all: rollicking fun, danger, heart, family bonds, and a pinch of budding romance. It's aimed at middle grade readers, so it's a fast read. But the plot kept me hooked, and I'm already excited to dive into book two. The story revolves around a pair of twins who are separated while they are on the run from gangsters, pirates, and the law. T ​"I bought 'er that shell from Tahiti. She sewed it over her eye patch so she could watch over me, no matter the distance between us." The story revolves around a pair of twins who are separated while they are on the run from gangsters, pirates, and the law. The bond between them plays a large role in the novel, but there's are also themes of found families and I loved that inclusion. Graphic novels illustrated in full color are my kryptonite. Rebecca Mock did a great job will the artwork here. I enjoyed her style and use of color to set the mood. She's only worked on this series, but I'm looking forward to seeing more from her. There is a heartbreaking side story of a sailer and his lost love (the quote above is from their tale), and I do hope the author considers giving them a spinoff novel. I read this with our 5yo, and we both enjoyed it. The storyline stretched her (it's a visuals-centric tale with two sets of identical twins after all...and there are some ship names and a variety of geographic settings - details to track), but - with a few pauses to review who characters were and where in the world they were - it was a fun story. As so often happens with main-character youth, Cleo and Alex's parents aren't in the picture. The adventures of untethered youth are interesting as any I read this with our 5yo, and we both enjoyed it. The storyline stretched her (it's a visuals-centric tale with two sets of identical twins after all...and there are some ship names and a variety of geographic settings - details to track), but - with a few pauses to review who characters were and where in the world they were - it was a fun story. As so often happens with main-character youth, Cleo and Alex's parents aren't in the picture. The adventures of untethered youth are interesting as anything seems possible and, well, they have to survive, don't they? Consequently, outlandish schemes seem reasonable and one can suspend belief as they stowaway on ships and run through the Central American jungle and such. 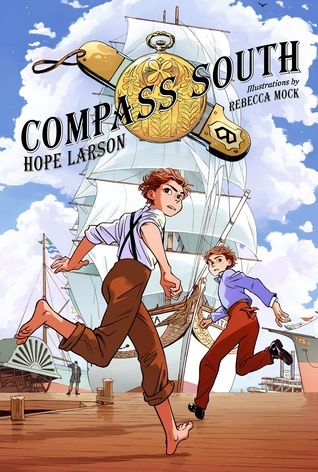 "Compass South" by Hope Larson is a graphic novel targeted towards children who read at an intermediate grade level, 3rd-6th grade. I would identify as a Fantasy Fiction graphic novel because though the setting takes place in a somewhat realistic mid-1800s setting, the story includes ghosts, telepathy, and magical treasure maps. Text-to-Self: The novel focuses on a pair of twins who become separated during a voyage to San Francisco. Most of the novel focuses on the twins separate journeys to San Francisco and their plight to re-uniting. The connection the twins share and the lengths they're willing to go to finding each other reminds me of the connection I share with my own family. I can relate to the feeling of loss both siblings share when they lose each other because of the value I place in my own family and the fear I have experienced when my brother was in a serious car accident. Text-to-Text: This novel shares a strong connection with the classic novel "Treasure Island". "Treasure Island" focuses on a young boy who is flung into an adventure on the open sea to find buried treasure. It is very possible that "Treasure Island" was a leading inspiration for the author of "Compass South" because many of the same plot devices are used in the graphic novel to progress the story and to excite the audience. Such similarities include: maps bestowed to the protagonist that lead to buried treasure, long voyages out at sea, pirates, and deception from a former crew mate. Fun enough that I'd read the next one, but I'm not too pressed to pick it up as this book had enough of a resolution to satisfy. Not nearly as queer as I'd like it to be. Why do girls dressed as boys always always always have to find a romance with a boy? Bit sick of that. Otherwise, great illustrations, fun colours, and an adventurous enough story. This swashbuckling adventure immediately transported me back in time to a world filled with pirates, ships, gangs, lost family, and, of course, a search for treasure. Although there were a few too many coincidences to completely suspend disbelief, the characters were full of colorful personality and the plot was nonstop action. I am looking forward to booktalking this one! I bought this book on a whim at a comic convention. I thought it would be a quick read and hopefully an enjoyable one, but I was wrong. The story was a lot more complex than I originally thought it would be. In fact, it reminded me a lot of books like Treasure Island and Kidnapped. The artwork was clean and understandable, but also very complex and at times downright beautiful. This is supposed to be a book for young adults, but I would recommend it for any fans of adventure stories. Picked this up because I had a feeling it might help me riddle out a character development hurdle in my own work. The hurdle has been vaulted and I had a very enjoyable time jumping. Quite a fun little adventure graphic novel. An adventure story about looking for family! Suitable for kids. Lots of narrow escapes and chase scenes, but little violence. Great adventurous story! Can't wait to see what happens in the next one when it comes out! A quick read. Fun, fast paced, a great adventure with twists, turns, and wonderful characters. Lookin forward to the second book. Fast-paced children's full-color graphic novel. A pair of orphaned twins goes on a cross-country adventure in 1860. A page-turner that includes an orphan gang, a child trafficker, a second pair of twins, an open-market brawl, train-hopping, high seas escapades, and swashbuckling pirates. Multiple villains heighten the conflict at every turn of events. Well plotted and effectively organized. The historical setting adds to this novel's charm. Art is not on the caliber of Amulet, but definitely above average. This upper elementary and early middle school adventure story will hit the spot with reluctant readers! Orphaned red-headed twins (two sets!) are racing across the country trying to answer the ad of a rich man in San Francisco whose own red-headed twins are missing. One set races to swindle him out of his money, and one set to find a family. Pirates, gangs, stowaways, treasure maps, jungles, sailing ships and a hint of romance combine in the 1860's. Some great accurate historical touches, vibrant This upper elementary and early middle school adventure story will hit the spot with reluctant readers!